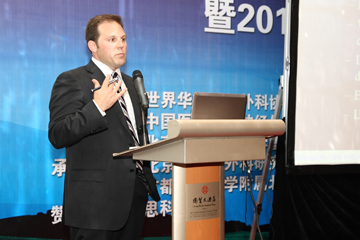 Recently, I had the honor of traveling to Beijing at the invitation of the Beijing Neurosurgical Institute to present a lecture on minimally invasive cervical spine surgery. 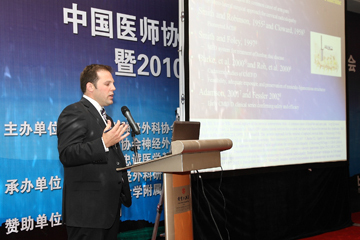 I gave my lecture as part of a seminar and workshop focused on the advancement of neurosurgical training in China. The experience was eye-opening and I gained tremendous insight into the state of neurosurgical and spine care in China. I was surprised to learn that the vast majority of spine surgery in China is performed by orthopedic surgeons, as opposed to both ortho and neurosurgeons. In the United States, and much of the world for that matter, spine surgery is performed by both of these specialties. In China, however, the neurosurgeons have not been largely involved in spine surgery for the most part. This is changing, and there is a very concerted effort on the part of Chinese neurosurgeons to learn minimally invasive spine surgery techniques and incorporate this into their practice. On the basis of my training and expertise in minimally invasive spine surgery, I was invited to take part in this very exciting educational effort. I found that there is an abundance of very advanced and sophisticated surgical equipment available and being developed in China, and it is used with great expertise and success by Chinese surgeons. In particular, the quality of endoscopic equipment and the surgical skill in using it is very advanced in cranial applications and this translates very readily to the techniques and concepts upon which minimally invasive spine surgery is based. The workshop that I took part in is one of the first of many that will hopefully evolve into a successful foundation for spinal surgery education in China, and I look forward to more trips to come as well as potentially developing a stateside workshop for visiting Chinese neurosurgeons. Fortunately, I did find time to see the sights a bit and the highlight for me was visiting the Great Wall. It is unbelievable how so many workers were organized to build such a monumental undertaking without modern technology or communication. I look forward to returning and am extremely grateful to my hosts for making it such a memorable experience. It is so nice you had this opportunity. It is also encouraging the new innovations that China is driving into. It is something many people will benefit from in the future. I am envious of the trip. I know you had a great experience! i am interested in looking into he discectomy . I live in indiana and cant’ find anyone that offers it. Everyone wants to do a fusion and i am not into that. Dr. Musacchio is a true hero! Since he reached the Great Wall, as well as he helped us patients having spine problems with his healing hands and caring heart, so we could enjoy our daily lives again! Thank you, Dr.!